1) Is the local weather and altimeter setting available on a 24-7 basis? Negative. As noted, both the ATIS and CYBL Radio operate on a limited-hour basis, leaving no local weather information during the off hours. 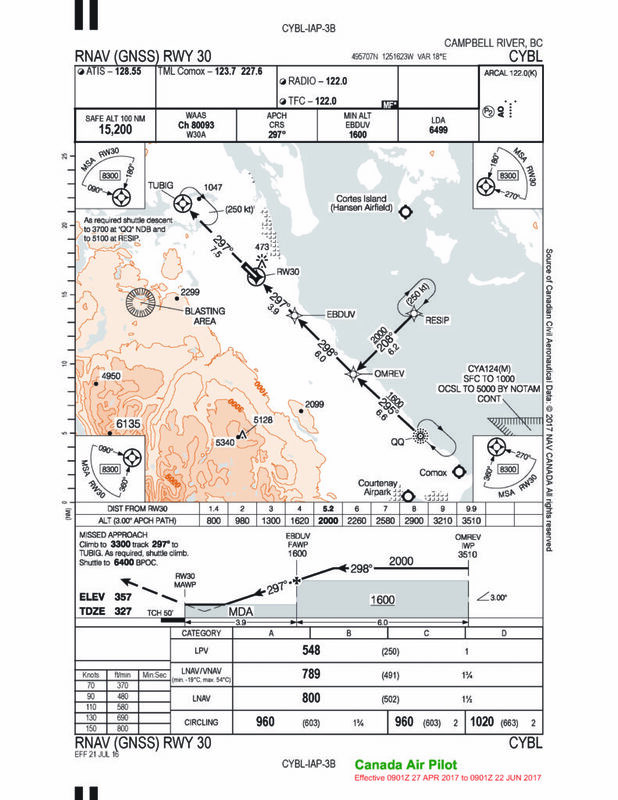 2) What is the acceptable temperature range to fly the LNAV/VNAV approach? Note in the minima box, minimum -19C to maximum +54C. 3) If flying the RESIP transition for the straight-in approach, what is the bearing and distance between RESIP and OMREV? Also, what is the minimum allowable altitude between these fixes and the obstacle clearance provided when cleared for the approach? 208°; 6.2 NM; 2,000 feet and it provides for 1,000-foot obstacle clearance. 4) While flying the LNAV approach, you are established on final at 2,000 feet and are planning on conducting the CDFA approach. At what point should the descent be initiated? 5.2 NM back from RW30 (MAWP). 1.3 NM back from EBDUV. 5) Relative to the above, your groundspeed is 100 knots, what should be your target rate of descent and target FAWP crossing altitude? 530 FPM and 1,600 feet ASL. 6) Name the fly-over waypoints within this procedure. In the CFS CYBL indicates an LWIS for use after hours. The ATIS is not available, but local weather and an altimeter setting would still be. Is that correct?